What truly sets my High Performance Handbook Nutrition Guide apart from nearly any other product is the 37 pages I devote to the Health and Lifestyle Section. We know how important proper training and nutrition are to getting the performance, health and body composition you want. However, what often goes under-appreciated are the other factors in your life that can have just as massive an impact on your results, namely: stress, sleep, and our environment. These variables can affect every bodily system, and not taking them into account will prevent your from achieving the results you desire. Still don’t believe me? Check out these excerpts from the Health and Lifestyle Section, and see if whet’s your appetite for more! We all know that sleep is important for our health. However, many of us (if not most of us) tend to act as if that just doesn’t hold true for ourselves. We seem to believe that we can get away with it. While you may blame “work” or simply being “busy,” research clearly and consistently shows that people miss out on sleep due to something called “voluntary bedtime delay.” Basically, we stay up late because we want to, often watching “Keeping Up With the Kardashians” re-runs, or mindlessly reading useless info on Facebook. No matter the reason, it is unlikely to actually be more important than logging sufficient and quality shut-eye. In the big picture, sleep is just as important as nutrition and exercise when it comes to improving your health, performance, and body composition. The average adult gets about 6 hours and 40 minutes of sleep per night. In fact, about 30% of the population gets fewer than six hours per night. Women tend to sleep a bit more than men, and people who carry high amounts of body fat tend to sleep less than those with a normal body fat level. Studies suggest that people who sleep fewer than six hours per night gain almost twice as much weight over a 6-year period as people who sleep 7-8 hours per night. Excessive sleep isn’t necessarily better, either; those who sleep more than nine hours per night have similar body composition outcomes as those who sleep less than six hours. It is important to note that sleep debt is cumulative, meaning that the more nights with less sleep, the greater likelihood of negative effects taking place. The good news is that you can catch up with just a few consecutive nights of adequate sleep. Experts hypothesize that each hour of sleep debt needs to be repaid eventually, so don’t let it add up. Okay, so we know lack of sleep is a problem. As researchers have noted regarding sleep debt: “these alterations are similar to those observed during aging and sometimes during depression.” Awesome. Fortunately, research also shows that simply getting adequate sleep can quickly right the ship on these issues. So, how do we go about creating an environment conducive to optimal sleep? Well, here is a step-by-step guide on getting sufficient, and restorative, sleep. Hundreds of chemicals are capable of inducing cancer in humans or animals after prolonged or excessive exposure. Chemically-induced cancer generally develops many years after exposure to a toxic agent. For example, a latency period of as much as thirty years has been observed between exposure to asbestos and incidence of lung cancer. According to the report, there are about 80,000 chemicals in commercial use in the United States, but only about 2% of those have been assessed for their safety. The report singles out radon, formaldehyde, and benzene as major environmental toxins that are causing cancer. Radon: What is it, Where is it, and How do I Get Less of it? Radon is a colorless, odorless, radioactive gas. It comes from the natural decay of uranium or thorium found in nearly all soils, and it typically moves up through the ground and into the home through cracks in floors, walls, and foundations. It can also be released from building materials or from well water. Radon breaks down quickly, giving off radioactive particles. Long-term exposure to these particles can lead to lung cancer. The U.S. Environmental Protection Agency estimates that radon causes about 21,000 lung cancer deaths in the United States each year, with 1 in 20 U.S. homes having elevated levels. Radon exposure is the second leading cause of lung cancer after smoking, and the leading cause among non-smokers. Testing for radon and taking the necessary steps to lower radon levels in homes that have elevated radon can prevent many radon-related lung cancer deaths. This process is known as radon mitigation. Getting your home air and water (if you are on a well) checked is simple and inexpensive – and can save your life and the lives of your loved ones. Formaldehyde: What is it, Where is it, and How do I Get Less of it? Formaldehyde is a colorless, flammable, strong-smelling chemical that is used in building materials and to produce many household products. It also occurs naturally in the environment and is produced in small amounts by most living organisms as part of normal metabolic processes. Formaldehyde has been classified as a known human carcinogen by several government agencies. Research studies of workers exposed to formaldehyde have suggested an association between formaldehyde exposure and several cancers, including nasopharyngeal cancer and leukemia. Rats exposed to formaldehyde fumes developed nasal cancer. The EPA recommends the use of “exterior-grade” pressed-wood products to limit formaldehyde exposure in the home. Ensuring adequate ventilation, moderate temperatures, appropriate humidity levels (through the use of air conditioners and dehumidifiers), and the use of indoor plants can also reduce formaldehyde levels in homes. Benzene: What is it, Where is it, and How do I Get Less of it? Benzene is a colorless liquid that evaporates quickly. It is naturally found in crude oil and is a basic petrochemical. Unfortunately, it is also a known human carcinogen. Benzene is found in tobacco smoke, gasoline (and therefore car exhaust), pesticides, synthetic fibers, plastics, inks, oils, and detergents. Benzene has also been found in soft drinks (since removed or reformulated), and dryer emissions from scented laundry detergent and dryer sheets. About 50% of the benzene exposure in the US results from smoking tobacco or from second-hand smoke. Substantial amounts of data link benzene to aplastic anemia, bone marrow abnormalities and leukemia – particularly acute myeloid leukemia (AML) and acute non-lymphocytic leukemia (ANLL). To decrease benzene exposure, don’t smoke, and try to avoid second hand smoke. Ensure adequate ventilation in your home, use non-scented laundry detergents and dryer sheets, and keep plants in the home. Cleaning supplies come in all shapes and sizes, with an infinite amount of marketing and advertising to promote them. It is hard, if not downright impossible, to know today what you really need to clean your home. Which chemicals may do more harm than good? Which companies are actually trying to marry safety and effectiveness, not just worrying about their bottom line and shareholder profits? In addition, personal care products and cosmetics are also ubiquitous in society today. We all use them to look better, smell better, and feel better about our presentation to the world. Unfortunately, many of these products are known contributors to poor air quality and various other health problems. Many ingredients in personal care and household cleaning products are known to harm or irritate the lungs and trigger asthma, even in healthy people. Some products even contain ingredients that are known endocrine disruptors and are linked to cancer and reproductive abnormalities. They also pose a great threat to aquatic life as they eventually end up in waterways. You can forget trying to read the labels to discern their safety, though. Not only do labels require a PhD in advanced chemistry, but federal law in the U.S. allows companies to leave many chemicals off labels. These acceptable omissions include nano-materials, ingredients considered trade secrets, and the ingredients of “fragrance.” Instead, they use of terms like “cleaning agent” or “quaternary ammonium compound” for anything they decide they don’t want to list. Your best bet is to check for warnings and the ingredients I will cover next. Don’t be fooled by marketing claims. You might think that this is a hyperbole or tree-hugging paranoia and that your government would not allow such dangerous chemicals to be so widely used, and to not require them to be listed. You would be wrong. In the U.S., companies that make cleaning or personal care products may use nearly any ingredient or raw material in their product formulations without government review or approval. They are not required to disclose all of their ingredients on the label. The Toxic Substances Control Act of 1976 laid out what the EPA could do to regulate the industry: essentially, not much. If a product or chemical is deemed to pose an unreasonable risk of injury, companies can voluntarily recall a product. These recalls tend to focus on immediate injury risk such as chemical burns or fire hazards, not subtle problems with chronic implications, such as asthma or cancer. Companies do not have to prove chemicals are safe before putting them into cleaning products. In fact, in its more than 30-year history, the Cosmetic Ingredient Review (the cosmetic industry’s safety panel) has assessed fewer than 20% of cosmetics ingredients and found only 11 ingredients or chemical groups to be unsafe. The chemical industry as a whole is largely unregulated. There are over 80,000 chemicals in use in the U.S., and the vast majority have never been assessed for safety by federal regulators. In addition the terms “hypoallergenic” or “gentle” do not necessarily indicate a product is safer, or is even those things. A company can use a claim like “hypoallergenic” to mean anything, or nothing at all. Remarkably, the Environmental Working Group conducted an assessment of over 1,700 body care products and found that 81% of those marked “hypoallergenic” or “gentle” contained allergens or skin and eye irritants! In the U.S., there are more than 500 products sold that contain ingredients banned in cosmetics in Japan, Canada, or the European Union. The FDA also has little authority over cosmetic companies, cannot recall harmful cosmetics, and relies on companies to report injuries from their products a voluntary basis. 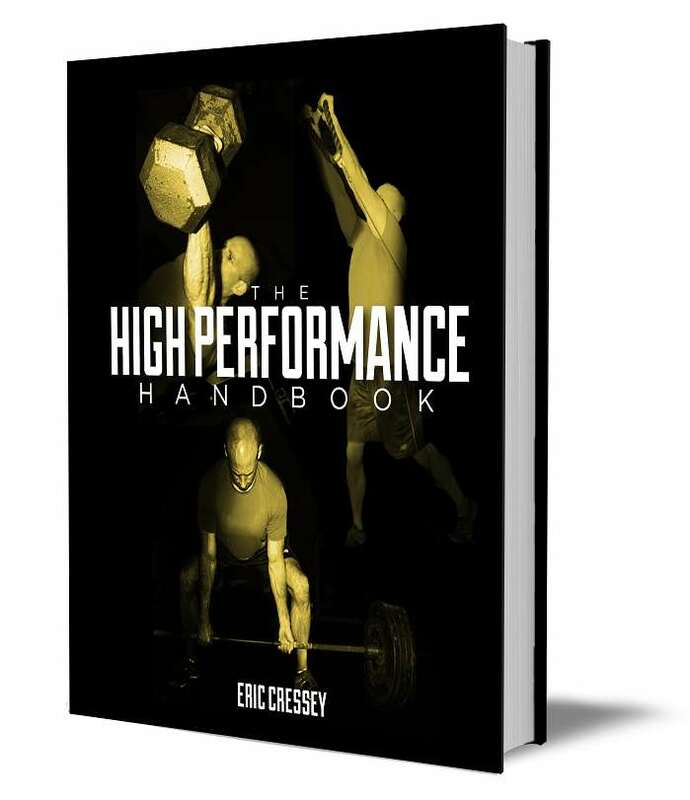 Pick up your copy of The High Performance Handbook today before the introductory price expires Saturday at midnight! 1. ANOTHER all-expenses-paid trip to get evaluated and train at Cressey Performance. Again, Eric will cover all your travel and accomodations expenses, and the training will be on the house. 2. One of three free copies of his “Art of the Deload” e-Book. 3. One of three free online accesses to Mike Reinold and Eric’s new “Functional Stability Training of the Lower Body” online resource! There are only 36 hours left, so don’t miss out! Check out the BSP Training & Nutrition Newsletter! Weekly updates and exclusive content. The 20-page report "The Truth About Saturated Fat & Cholesterol." 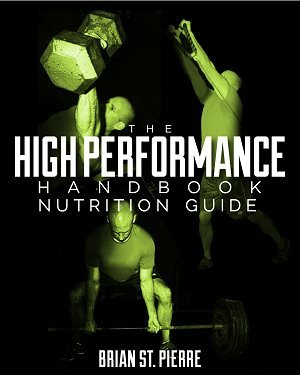 Is it possible just to purchase your nutrition guide without the full high performance handbook?